A huge shout out to AMAT’s African-American Workgroup for helping to put together such a wonderful list of leaders, volunteers and advocates to profile during the month of February – Black History Month! We received more profiles that would fit into the month-long celebration, but don’t worry – We will feature those not in this month’s toolkit on our social media at a later date in the year! The toolkit includes a suggested post schedule, copy to accompany your social media posts, and a customizable press release for your organization/OPO. Graphics are also included in the folder and feature a few posts/banners that are customizable. Please send any stories, events, and photos to Laura Rodriguez-Carbone, AMAT Chair of Public Relations. AMAT Members, Industry Partners, and Supporters: If your organization has a goal of accelerating more African American staff into leadership roles, you don’t want to miss this compelling conversation. 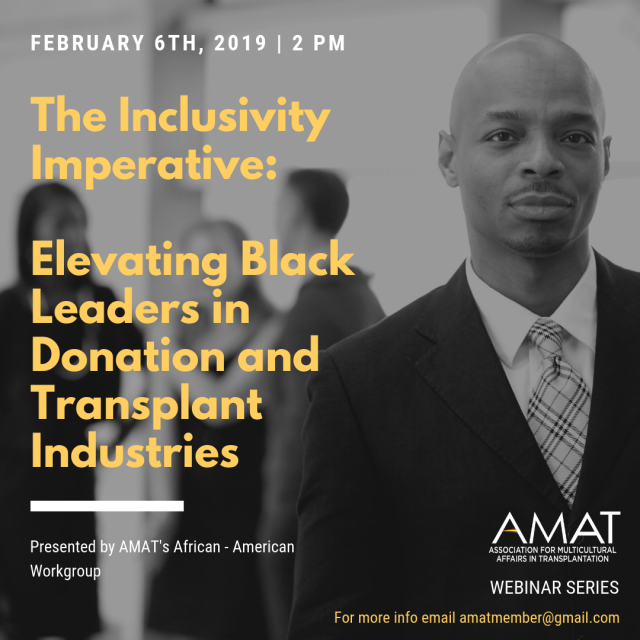 The Inclusivity Imperative: Elevating Black Leaders in Donation and Transplantation Industries, on Wednesday, February 6, 2019, from 2:00 – 3:00 p.m. Eastern Time. In addition to the webinar, we are asking all African-Americans who work in donation and transplant to let their voices be heard in our survey. We are accepting responses until Feb. 28 and will use the data to establish a baseline sentiment for African-Americans perceptions of their professional experience in this field. Your participation is needed! Please Note: You do NOT need to register for this webinar. You will need to click on the visual link below to join the session and view the presentation and utilize the dial in number to hear the presentation. Simply click the link below and dial in on the phone with the participant passcode for sound.